Before the Austrian-Hungarian invasion of 1102, the area of present-day Croatia included the auonomous regions of Slavonia and Dalmatia. Jews had been living in the area since the seventh century, C.E. While there are documents indicating the existence of Jewish communities in the area, little information is actually known about the Jews of Croatia until the 13th century. Documentation of laws against Jewish mercantilism have been found in the area dating back to this period. Jews were not allowed to settle or trade in the area because they were competition for the non-Jewish merchants. In the 13th and 14th centuries, the Jewish communities in Zagreb and Sava (two cities within the region) were able to rule themselves with a leader called a "magistratus Judaeorum." The Jews enjoyed economic prosperity and peaceful relations with the non-Jewish Croats. The rest of the country also prospered from the Jewish presence, and the wealth of the region increased. The Jewish population increased in Croatia for a century and a half. In 1456, it was decided that the number of Jews was too large, and they were terrorized and then finally expelled. After 1526, and for the next 200 years, there are no records of Jewish existence in Croatia. In the 1700s, Jews began to immigrate back to Croatia. The influx was very gradual until 1782, when Emperor Joseph II published "Toleranzpatent." The document called for equal treatment of all citizens. After its publication, many more Jews began to immigrate to the area. Jews were granted residence in 1791, but they were not given full citizen rights until 1873. From 1879 to 1900, the Jewish population in Croatia increased from 869 persons to 20,000. More than twenty-one Jewish communities had been established throughout the area. In the beginning of the 20th century, conflict erupted between the Zionist and Assimilationist Jewish groups in Croatia. While the Zionists wanted to maintain their Jewish identity and promote ties with Israel, the Assimilationists identified with their non-Jewish counterparts. The Zionists maintained political power until World War II, and they were fueled by persecution on the part of right-wing Catholics. By the beginning of the Nazi occupation in Croatia, more than 25,000 Jews lived in Croatia. Many Jews had immigrated to the United States and Israel to avoid rampant anti-Semitism. The Jews that remained in Croatia were extremely prosperous, causing even more hatred to fall upon them. Still, Jews continued to build synagogues and Jewish businesses. Many Jewish children attended universities and art academies. In 1941, the Nazi regime began to attack the intellectual Jewish community. Many of the Jews fled for neighboring regions and others were deported. Croatia appeased the Germans throughout the war, sending many of its Jews to concentration camps. The majority of those Jews who remained in Croatia were taken to Auschwitz in 1943. Only 5,000 of the 25,000 Croatian Jews survived the Holocaust. In 1991, Yugoslavia's republics began their violent breakup. While the entire region was negatively affected by the breakup, Jews, in particular, were thrown into the middle of the situation. Anti-Semitism was not blatant during the 1990s, but rather, it was used as a way to win Jewish favor. Both the Croatians and the Serbs would accuse each other of anti-Semitism, hoping to bring Jews to their own side. Today, approximately 1,700 Jews live in Croatia. They continue to suffer from sporadic anti-Semitism and Holocaust denial is especially prevalent as the most common method of anti-Semitism. In 1997, the head of state, Franjo Tudjman, apologized to the Jewish people for country-wide Holocaust denial. The Jewish community has become assimilated into Croatian society since the end of World War II. Many Jews are now government officials, doctors, lawyers, and judges. Recently, however, members of the Christian Church have begun to align their corporations so as to hurt Jewish businesses. The separate Jewish communities are not connected by a stronger Croatian Jewish organization. For this reason, they have had difficulty combating anti-Semitism in their cities. 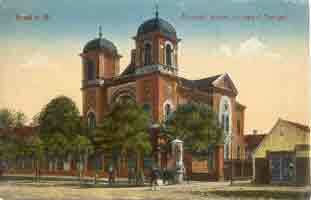 Today there remain synagogues in many of the major Croatian cities. The city of Dubrovnik is home to the second oldest synagogue in the world. In July 2013, the Jewish community in Zagreb announced plans to rebuild the Prague Street Synagogue on the same site as the old building which had been destroyed by the Ustasha fascist regime in 1942. Designed by the architect Franjo Klein, the Prague Street synagogue originally opened in 1867 and debate over whether to rebuild the synagogue has been ongoing since at least 1991. Due to U.S. objections, Israel was forced in 2019 to cancel a planned sale of F-16 fighter planes to Croatia. Itamar Eichner, “Israel to Croatia: F16 sale cancelled because of U.S. objections,” Ynet, (January 6, 2019).